When using equipment to plant various crops, such as corn or soybeans, farmers have historically made trade-offs between seed placement accuracy (i.e., optimal spacing and depth control) and planting speed. 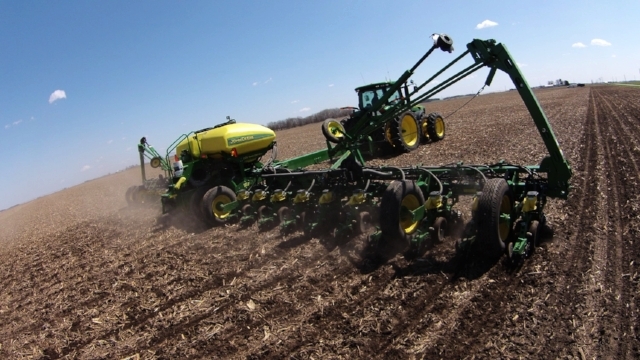 Notably, under some common planting conditions, the accuracy of a planter’s seed spacing can decline as speeds increase, resulting in lower crop yields, and lost sales for farmers. Undesirable variation in resultant in-ground seed spacing can be attributed to differences in how individual seeds exit the metering system and drop through the seed tube. The spacing variation is exacerbated by higher travel speeds through the field which amplifies the dynamic field conditions. Further seed spacing variations are caused by the inherent relative velocity difference between the seeds and the soil as the seeding machine travels through a field. This relative velocity difference causes individual seeds to bounce and tumble in somewhat random patterns as each seed comes to rest in the trench. To address this problem, Deere developed the ExactEmerge corn and soybean planter, which Deere describes as doing three things: (1) The planter captures an individual seed from the meter. (2) The seed is transported from the meter to the trench. (A traditional planter lets the seed fall using gravity). (3) the seed is accelerated at the discharge point rearward to a horizontal velocity that matches the ground speed. The result is that the seed leaves the planter traveling at the same speed as the planter, regardless of how fast the planter is traveling. Precision Planting has developed similar technologies to accomplish the same result--high-speed, accurate planting. The complaints specifically mention Precision Planting's vSet Classic and vSet2 seed meters, as well as SpeedTube, Precision Planting's mechanism for transporting the seed from the meter to the trench by use of belt. These devices accomplish the same three tasks as Deere's ExactEmerge. According to the lawsuits, the crucial part of Deere's claim is that "[w]hen one of Defendant’s vSet Products is combined with Defendant’s SpeedTube product, the combination infringes Deere’s patents." Precision Planting sells vSet and Speedtube together, and encourages use together, but it is this combination that Deere alleges infringe its ExactEmerge system's patents. One outcome is that Precision Planting and AGCO prevail, meaning nothing changes. Another outcome is that Deere prevails. If so, the court would award Deere damages that flow from the patent infringement (such as lost profits on sales). The court could also stop sales of vSet and SpeedTube products until a royalty agreement between Deere and AGCO is reached. There is no injunction in place now, meaning that dealers can continue to sell vSet and SpeedTube while the litigation proceeds to trial. Patents can be valid for up to 20 years, and Deere's ExactEmerge patents were filed in 2014. That means there is a lot of money at stake here and this suit is likely not going away any time soon. AGCO has not yet responded. Janzen Ag Law does not represent Deere, Precision Planting, or AGCO and we express no opinion as to the validity of any parties' claims in the lawsuits.